Theoretically there should be, and empirically there is, no greater distance/time interval for anything (even a light ray) to travel or propagate between two relatively stationary objects, regardless of their assumed in-tandem inertial motion through space in any direction. Also, there was no relative motion or physical displacement of matter (i.e. mirrors) within the light paths of Michelson’s apparatus that could be detected by Michelson’s interference of light method during his experiments. Such relative motion or displacement of a focusing mirror was only detected before his experiments. Thus, the paradox of Michelson’s null results can now be completely explained in many ways. For various reasons, Maxwell, Michelson, Lorentz, Fitzgerald, Einstein, and others imagined, assumed and believed that a light pencil propagating to and fro in Michelson’s apparatus would have to propagate a greater distance and a greater time interval in the direction of the Earth’s orbital motion relative to the Sun. However, no greater time interval was ever detected by Michelson in the form of an interference fringe shift. In Chapter 10 we discussed, explained and demonstrated that Maxwell’s, Michelson’s, Lorentz’s, Fitzgerald’s and Einstein’s theoretical assumptions and mathematical computations concerning Michelson’s experiments were both absurd and invalid. How could Michelson detect an invalid assumption or an ad hoc mathematical computation that did not exist? We also demonstrated that the theoretical contraction explanations for why a fringe shift (or a greater time interval of propagation in the direction of motion) was never detected by Michelson, were not only solutions of desperation; they were also invalid, ad hoc and meaningless. These contraction explanations by Fitzgerald, Lorentz and Einstein were obviously an artificial attempt to justify many of such invalid theoretical assumptions (i.e. stationary ether) that produced the paradox of Michelson’s null results in the first place. In spite of the facts that such contraction explanations appear to be so contrived and that they have such obvious theoretical flaws, they still remain to this date the only orthodox “explanation” for Michelson’s paradoxical null results. This is especially true of Einstein’s coordinate contraction measurement; his so-called “relativistic contraction solution.” The primary reason for this continued acceptance of such contraction theories is the lack of viable alternative explanations. In Chapters 10 and 11, we have already begun to suggest several viable alternative solutions. In this chapter we will further analyze, explain and demonstrate the false premises which resulted in the M & M paradox, and the real theoretical, empirical and technical reasons for Michelson’s null results. This should complete the necessary explanations for why such paradoxical null results occurred, and why Michelson’s null results were actually correct. A. Theoretically, in the absence of stationary ether, when any two material objects are relatively stationary, there is a definite finite distance for anything (including a light ray) to travel or propagate to and fro between their relative positions, regardless of their real or imagined in-tandem inertial motion through space and relative to other celestial bodies. 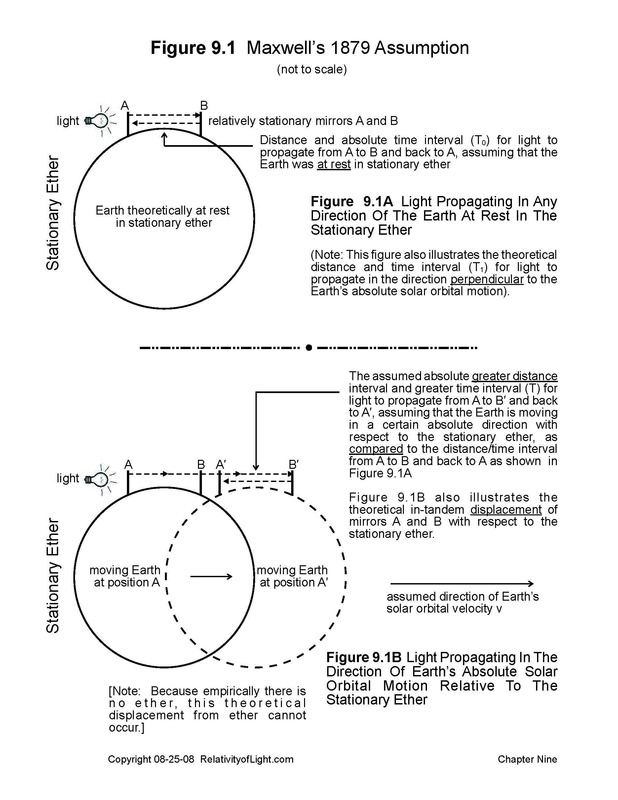 In his recent book entitled, Challenging Modern Physics, Kelly states the following concerning the 1887 Michelson and Morley experiment: “If there were an ether, the time measured for light emitted upon earth to travel at right angles to the direction of the motion of the earth on its orbit around the sun should prove different from the time for light to travel in the same direction as the motion of the earth upon its orbit” (Kelly, p. 3). Stated somewhat differently: If the M & M apparatus was theoretically absolutely at rest in a stationary ether, then a priori a light ray emitted from an absolutely stationary light source on such absolutely stationary apparatus would propagate away from the position of such absolutely stationary light source at c in any two different perpendicular directions over the same finite distance from the absolutely stationary light source to each absolutely stationary reflecting mirror and back again during the same time intervals (Figures 9.1A, 9.2A and 10.1A). On the other hand, if Michelson’s apparatus was theoretically moving inertially and displacing at v away from the stationary ether, then the longitudinal light ray would a priori propagate a greater distance during a greater time interval away from its absolutely stationary point of emission in the ether in the direction of such motion at c – v in an attempt to catch up to the reflecting mirror which was also displacing from such absolutely stationary point of emission and from the tip of such propagating light ray (Figures 9.1B and 9.2B). Once the propagating light ray theoretically caught up to the displacing reflecting mirror, it would then reflect from such linearly moving reflecting mirror and return to the moving light source at c + v, all during a greater total time interval than if the apparatus was absolutely at rest in the stationary ether (Figures 9.2B, 9.2C and 10.1B). Regardless of such imaginary theories, all of the above theoretical assumptions are completely meaningless false premises, for the following reasons. First of all, and most importantly, there is no stationary ether from which to measure the propagation of light or the motion (displacement) of a material apparatus. Therefore, the M & M apparatus never could be absolutely at rest in something that did not exist, nor could there ever be a greater distance of light propagation in any direction from a non-existent point of light emission absolutely at rest in space, nor could any light source or reflecting mirror be displacing from an absolutely stationary point of emission in space that did not exist, nor could there be any difference in time intervals for light to propagate in any absolute directions that did not exist. All of these theoretical false assumptions were impossible. They were merely invalid myths. Let us now observe and discuss what actually happened within Michelson’s apparatus at four (4) different times, in the absence of ether (Figure 12.1). The emitted light rays (pencils) in the M & M apparatus actually propagated to and fro at c from the relatively stationary beam splitter (BS) in Michelson’s apparatus (Figures 12.1A and 12.1B), over a finite distance (d1 or d2) to a relatively stationary reflecting mirror (m or M) and back again to the relatively stationary beam splitter (BS) during the same time intervals (Figures 12.1C and 12.1D). Looking at Figure 12.1, it becomes obvious that there never could be any change of light wave phase for light pencils L1 or L2 during such finite propagation over the same distance to and fro which could have caused a fringe shift. The relatively stationary reflecting mirrors (m and M) never could be physically displacing from anything: from stationary ether, from the relatively stationary point of light emission (the beam splitter BS), nor from the tip of the propagating light rays. Thus, there never could be any greater distance/time interval of light propagation in any direction of motion of the apparatus. Michelson’s “missing time interval” was the difference between the time interval that a ray of light theoretically takes to propagate in Michelson’s apparatus shown in Figure 9.2, and the time interval such ray of light actually takes to propagate in the apparatus shown in Figure 12.1. Is there any confirmation for the author’s above analysis and conclusions, and for Figure 12.1? Absolutely. Most importantly, there are the experimental confirmations of Michelson’s experiments, which have been reconfirmed by others dozens of times. The empirical result of all of these experiments (vis. no observable fringe shift) is that there is no difference in time intervals for perpendicular light rays to propagate between relatively stationary mirrors within such apparatus, regardless of the assumed velocity and direction of motion of such apparatus. “You can only define what you can measure! Since it is self-evident that one cannot measure a velocity without seeing what he is measuring it relative to, therefore it is clear that there is no meaningto absolute velocity. The physicists should have realized that they can talk only about what they can measure” (Feynman, 1963, p. 16-2). There is also a second confirmation, which relates to the scientists misguided mathematical ether computations. One arrives at the same incorrect results of computation regardless of whether Michelson’s longitudinal light ray is theoretically emitted in the direction of the Earth’s solar orbital velocity v (Figure 9.2), or whether it is emitted in the direction opposite to such solar orbital velocity -v (Figure 9.8). Therefore, the solar orbital direction of motion or velocity of the Earth and the apparatus in Michelson’s experiment was irrelevant to the emission and propagation of the light ray, even for the scientists who made such faulty theoretical computations and who arrived at such misguided ether measurements. The fact that the enclosed system—Michelson’s apparatus with light rays propagating to and fro over finite distances between relatively stationary mirrors—was also moving through space, was irrelevant to that which occurred within the enclosed system. There was no way for the light rays propagating within the enclosed system to detect such motion of the enclosed system through space by the interference of light method devised by Michelson, because the motion of the enclosed system through space was not within the light paths of the light rays in Michelson’s apparatus (Chapter 12C). It is absolutely critical for the reader to fully understand the theoretical and empirical false premises of Michelson’s experiments in order to later fully understand why the concepts of Special Relativity and Spacetime are empirically false and physically meaningless. B. Empirically, when any two material objects are relatively stationary, there is a definite finite distance for anything (including a light ray) to travel or propagate to and fro between their relative positions, regardless of their real or imagined in-tandem inertial motion through space and relative to other celestial bodies. At this juncture it must be quite obvious to the reader that the mirrors in Michelson’s apparatus were not absolutely displacing from anything, including the tip of the propagating light ray. This still leaves one final question: did the light pencils in Michelson’s apparatus have any greater distance/time interval to propagate in the direction of the Earth’s solar orbital motion…for any empirical reason? In the remainder of this section we will empirically demonstrate that the answer to this question is: No! 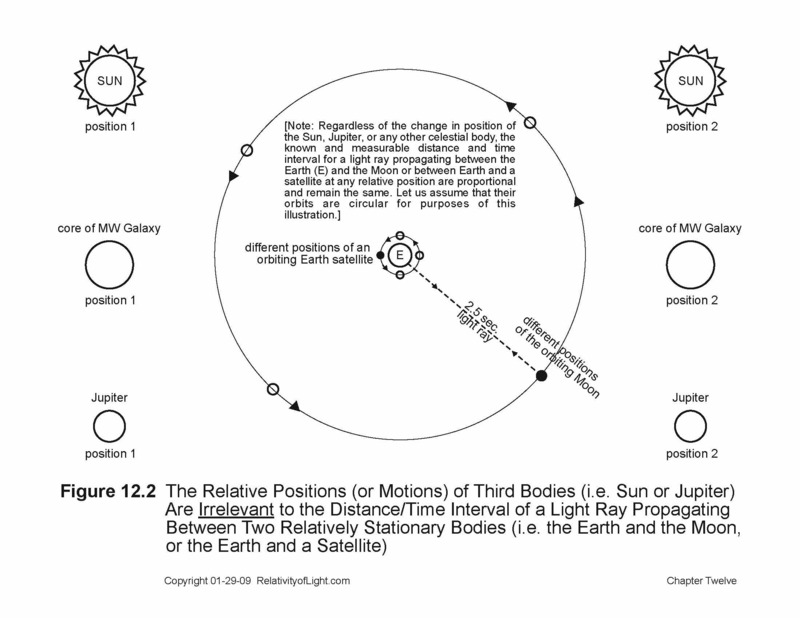 Let us now pick up from where we left off in Chapters 10 and 11 by further describing the relative positions of celestial bodies and the change of such positions. In the solar system, the relative positions of any two relatively stationary celestial bodies (i.e. the Earth and the Moon, or the Earth and a satellite) results in their definite finite distance apart at any instant in time. Therefore, a light ray transmitting at the constant velocity of c should take a definite time interval to propagate over this definite finite distance (from emission to receipt), whatever such finite distance may turn out to be (Figure 12.2). For example, a light ray takes about 2.5 seconds to propagate over the approximate 375,000 km between the Earth and the relatively stationary Moon, and back again to the Earth. But the in-tandem change of position of the Earth-Moon two body system relative to any third celestial body (i.e. Jupiter, the Sun or the core of the MW Galaxy) will not change such definite distance or such definite time interval between the two relatively stationary bodies under consideration (i.e. the Earth and the Moon). In other words, the relative change of position of any third body (including the Sun) is irrelevant to the definite finite distance/time interval between the relatively stationary Earth and the relatively stationary Moon (Figure 12.2). Similarly, the relative positions of the relatively stationary beam splitter and the relatively stationary reflecting mirrors in Michelson’s apparatus resulted in their definite finite distance apart (Figure 9.4A). Empirically, if the definite distance between these two relatively stationary mirrors changes slightly when the micrometer focusing screw changes the relative position of one focusing mirror in order to create an interference fringe, then the distance/time interval for any light pencil propagating to and fro within the apparatus relative to such focusing mirror will change proportionately (Figure 9.4B). But the change of position of the Earth relative to the planet Jupiter, relative to the core of the MW Galaxy, or relative to the Sun will not change such definite finite distance between the beam splitter and each reflecting mirror. In other words, like the prior analogy, the relative change of position of any third body (including the Sun) is irrelevant to the definite finite distance between the beam splitter and each reflecting mirror. Therefore, a light pencil transmitting at the constant velocity of c and propagating to and fro between the beam splitter and each reflecting mirror does not propagate any greater distance interval nor any greater time interval in the direction of the Earth’s solar orbital change of position (usually described as “motion”) relative to the Sun. 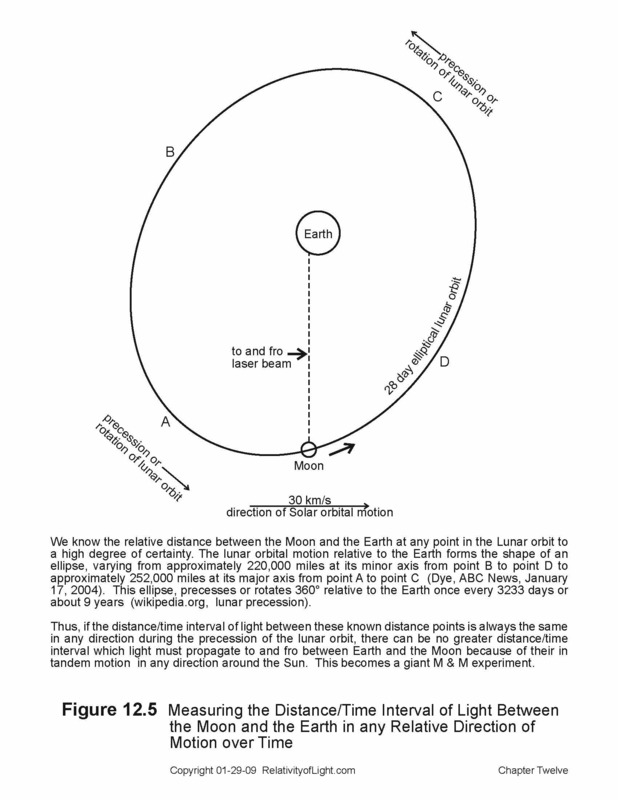 In the first above scenario, the only real and relevant distance/time interval for a light ray to propagate was the definite distance/time interval between the relative positions of the two specific celestial bodies (i.e. the Earth and the Moon, or the Earth and a satellite). In the second scenario, the only real and relevant distance/time interval for a light ray to propagate was the definite finite distance/time interval between the positions of Michelson’s opposing and relatively stationary beam splitter and his longitudinal mirror. 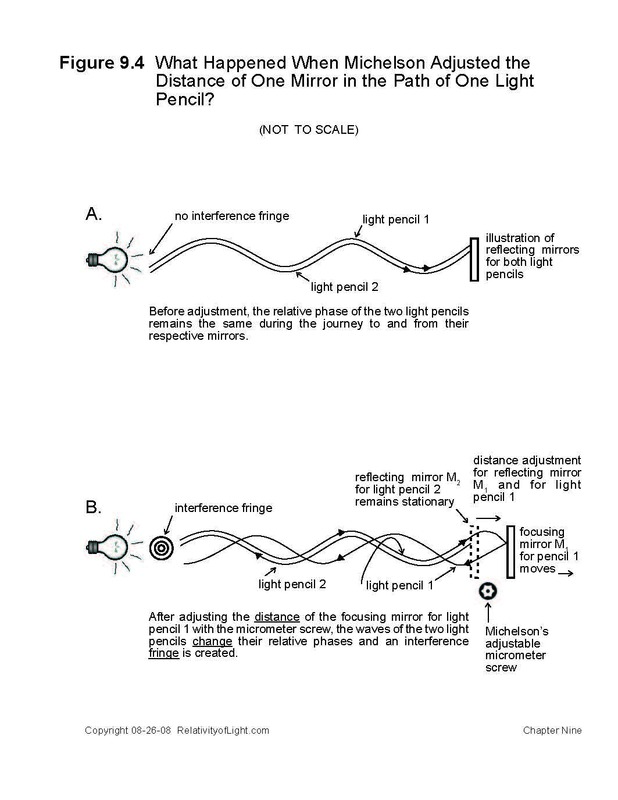 Also, in both scenarios, as we shall discuss in detail in Section C of this chapter, we are only concerned with what occurs within the light paths of such light pencils or light rays. All other positions (or changes of such positions) of third bodies which were not within the light paths of such light pencils or rays (whether or not such changes in position over time are characterized as motions or velocities) were irrelevant to the definite finite physically real distance/time interval which such light pencils or rays must propagate. Restated in a different way, the Earth may change its position or distance in space relative to other celestial bodies, but the light pencils in Michelson’s experiments did not propagate over any greater distance relative to such other celestial bodies  (Figure 12.4). They only propagated over the definite finite and physically real distance between and relative to such opposing stationary mirrors in Michelson’s apparatus. They did not propagate over any greater imaginary or inferred distance because of the Earth’s change of position relative to such other celestial bodies. In the remainder of this Section B, we will set forth numerous empirical examples that confirm the above conclusions. The distance between two poles on the surface of the Earth in any direction is a definite finite distance for a walking man, an automobile, a train, an airplane or a rocket to travel in each direction and back, regardless of any motion or change of positions of the Earth relative to other celestial bodies, including the Sun (Figures 12.3A and 12.3B). A man measures such distance with rigid rods as being the same finite distance in all-possible directions. These results hold true even where a light ray or another form of EM radiation is substituted for the material auto, train, or airplane. For example, when a laser beam is used to measure the finite distance between two relatively stationary material objects on the surface of the moving Earth, the same finite distance can be measured in all possible directions (Figure 12.3C1). This is true regardless of the rotational motion of the Earth, its solar orbital motion, or its much faster orbital motion around the core of the MW Galaxy. It is only when there is a displacement of a material body within the light path of the laser beam that any change of distance/time interval is detected (Figure 12.3C2). According to the Doppler principle of light, the empirical distance between two relatively stationary luminous bodies moving in tandem through space remains constant. This conclusion is evidenced by the constant frequency of light waves received on each opposing luminous celestial body, and it has been confirmed by observation (Gill, p. 14; Dingle, 1961, p. 13). The terrestrial principle of Doppler radar also appears to be relevant to this discussion. Empirically, a Doppler radar beam propagated in any direction from one stationary terrestrial object (i.e. a stationary police car) toward another relatively stationary terrestrial object (i.e. 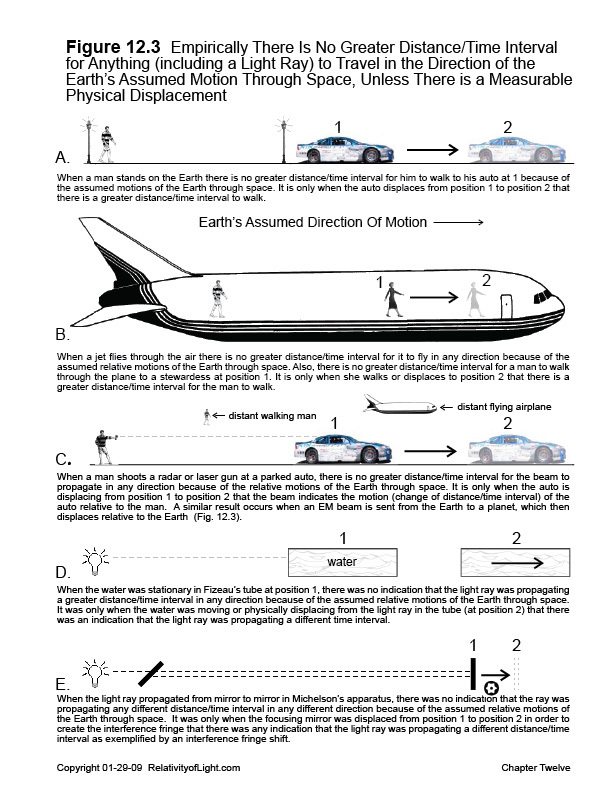 a parked car) does not detect any motion of the parked car, nor any increasing distance/time interval from the police car to the relatively stationary parked car because of any assumed motion of the Earth through space (Figure 12.3C1). The Doppler radar beam only detects a change in the relative distance/time interval of propagation when the parked car is observed to move linearly relative to the radar source (Figure 12.3C2), and then only within the “paths” of the radar beam. What happens if the police car with the Doppler radar apparatus in it moves at the same speed and in the same direction as the other auto…in other words, in tandem through space? Empirically, the police officer will not detect any relative velocity or relative increase in distance/time interval for his radar beam to propagate over such finite in-tandem relative distance. Why? Because the two autos are relatively stationary. 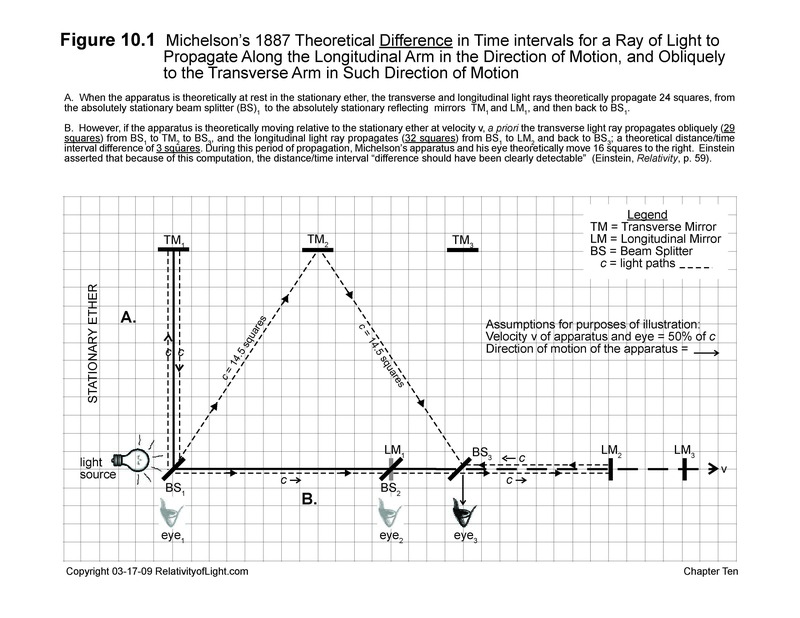 Like the above Doppler radar analogies, Michelson’s mirrors were stationary relative to the light source and the tip of the propagating light pencils in the apparatus. Michelson only detected a change in the relative distance/time interval of the propagating light pencil when the position (distance) of the focusing mirror was observed to be physically adjusted and displaced relative to the light source (Figure 9.4 and Figure 12.3E). This observed physical displacement of Michelson’s focusing mirror relative to his two out-of-phase light pencils created an interference fringe. But thereafter, when the light pencils were propagated in any direction, Michelson did not detect any further shift of such fringe, or any further motion of the relatively stationary focusing mirror. Nor did Michelson detect any increasing distance/time interval from the light source to the relatively stationary mirrors and back again caused by any change of position of the Earth relative to any other celestial body (including the Sun), outside of the paths of such light pencils. The two different results experienced by the aforementioned Doppler radar analogies appear to clearly and compellingly confirm the correctness of Michelson’s two similar different results, and the important empirical lesson to be learned therefrom. Empirically, there is no increased or different distance/time interval that an EM (light) ray must propagate between two relatively stationary objects (autos, luminous bodies or reflecting mirrors) by reason of their assumed in-tandem inertial motion through space in any direction. The 1851 interference experiment of Fizeau also appears to confirm the different results of the above Doppler radar analogies, the different results experienced in Michelson’s experiments, and the above empirical lesson. When the water (the light medium) in Fizeau’s 1851 experiment was observed to be stationary in the tubes, there was no fringe shift detected. It was only when the water was observed to be moving through the tubes, vis. physically displacing relative to the light rays, that a fringe shift was detected (Figure 12.3D; Chapter 7). 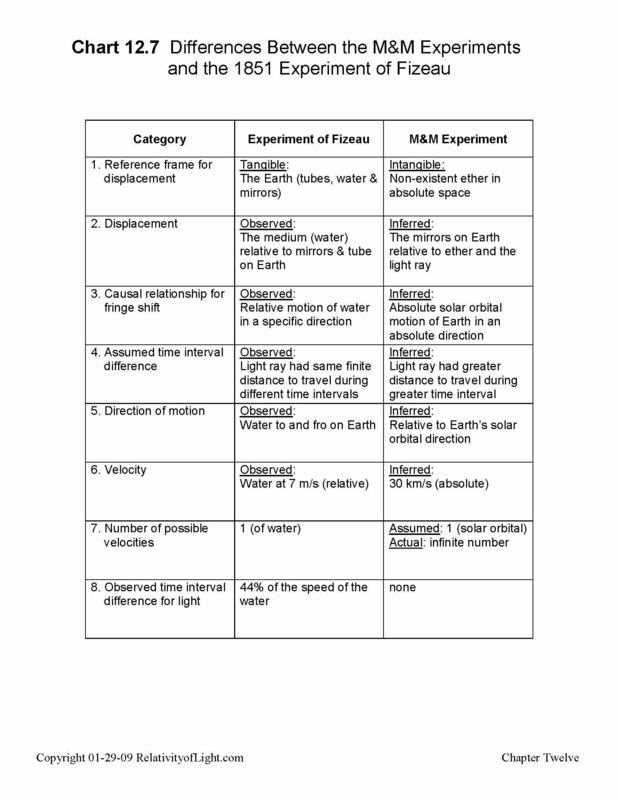 These similar different results lead us to again ask the question: Why did Fizeau’s experiment not detect the solar orbital motion of the Earth by a fringe shift when the water was stationary in his tubes? The answer is: the relative change of position between the Earth and any other celestial body (including the Sun) was completely irrelevant to the distance/time interval which the light ray must propagate within the light paths of Fizeau’s experiment. Let us now discuss another group of empirical and confirming analogies. Theoretically, we should know (by triangulation, laser and radar measurements, and other modern technological methods) the exact distance from the surface of the Earth to every satellite orbiting the Earth at every position of each orbit. If every EM signal sent from the Earth to each satellite and back over these precisely known distances has exactly the equivalent (proportional) time interval of propagation in every possible direction of the Earth, then empirically: 1) at any given instant the Earth and each Earth satellite are stationary relative to one another, and 2) there is no different distance/time interval for light to propagate to and from the Earth and such satellite in any possible direction by reason of any in-tandem motion of the relatively stationary Earth-satellite system through space (Figure 12.2). This second conclusion should also be confirmable for light or other EM signals emitted on the Earth and propagating to and fro between Earth and the Moon, or any other nearby planet in the Solar System. Assuming that the above conclusion is true, as it appears to be, then the light signal in Michelson’s apparatus propagating to and fro between two relatively stationary mirrors on the surface of the Earth would also not propagate any different distance/time interval because of any relative motion of the Earth through the Cosmos in a particular direction (real or imagined). This last conclusion was empirically confirmed by the null results of Michelson’s numerous experiments, but no one was willing to believe it. Conversely, when the relative distance is observed to physically increase or decrease between the surface of the Earth and a satellite, a rocket, the Moon, a planet or any other celestial object in the Solar System, then this physically observable and tangibly measurable displacement, changed relative position or changed distance must be added to or subtracted from the distance/time interval of a light ray propagating between such objects (Figure 12.4). 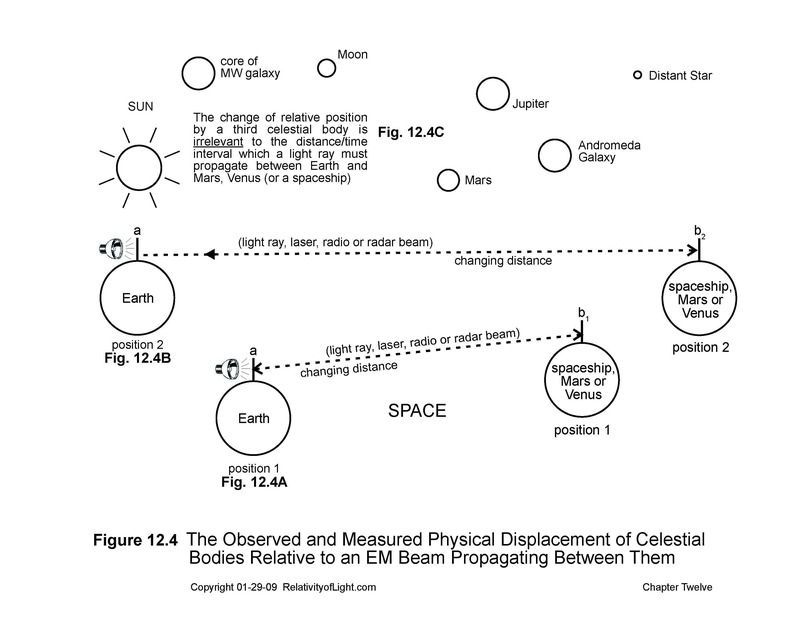 This conclusion can be confirmed visually through telescopes and by the distance/time interval for radio or radar signals to propagate from the Earth to and from such physically displacing rocket, planet or other linearly moving body. “[I]t is self-evident that one cannot measure a velocity without seeing what he is measuring it relative to…The physicists should have realized that they can talk only about what they can measure” (Feynman, 1963, p. 16-2). The above conclusions can also be substantiated by other empirical analogies. For example, we are now able to perform a giant experiment similar to Michelson’s experiments. Using a method called “laser ranging,” scientists can now send a laser beam from the Earth to an Apollo program reflector situated on the surface of the Moon, and back again to its terrestrial source (Figure 12.5). By measuring the time interval for this to and fro light propagation at c (at any instant), the distance to the Moon at any instant can be determined to an accuracy of less than one inch in any relative direction between the Earth and the Moon during their relative lunar orbital and solar orbital motions (Dye, ABC News, January 17, 2004). Because the slightly elliptical lunar orbit precesses (rotates) 360° about every 19 years relative to the Earth (Wikipedia.org, Lunar precession), we can now determine whether any laser measured distance/time interval between the Earth and Moon varies in any relative direction by reason of the Earth’s and Moon’s in-tandem motion through space. To the author’s knowledge, there is no current indication that it does. Similar results should also be testable with radar ranging between the Earth and the Sun and the other planets. It could also be tested with respect to their galactic orbital motions (Figure 12.6). The relevant empirical results from the above Earth-Moon laser ranging measurements should demonstrate that light rays emitted from the Earth propagate to and fro relative to the Moon the same proportional distance/time interval in all relative directions of the Earth over time, regardless of the in-tandem orbital change of position of the Earth-Moon system relative to the Sun or relative to the core of the MW galaxy. All of these empirical examples should be considered as a direct empirical contradiction to the theoretical assumptions of Maxwell, Michelson, Einstein, et. al. : that the distance/time interval for light to propagate from a material light source to a material mirror and back must be greater in the direction of the Earth’s solar orbital motions. Last, but not least, in Michelson’s experiments a ray of light propagated to and fro over a definite finite distance between the beam splitter and each reflecting mirror on the Earth’s surface in all possible directions of the Earth’s motions, and empirically each time interval of light propagation did not vary, because no fringe shift was detected. If one discards the ether theory and the “greater distance/time interval theories” of Maxwell, Lorentz, Einstein, et. al., then there was no paradox with respect to this scenario. There was no greater distance/time interval for light to propagate in any direction of the Earth at any instant. Michelson’s null results were possibly the best empirical confirmations for our answer to the above question. But, again, no one could believe them. 1. When the reflective target and the light source are observed to physically displace at v relative to one another, the distance interval and time interval which each succeeding light ray must propagate to and fro relative to the reflective target varies by ct ± vt.
2. But, conversely, when a light source and a reflective target are relatively stationary, the distance/time interval which a light ray must propagate to and fro through this finite distance in any direction remains constant, regardless of such system’s in-tandem motion through space in any direction.The author suggests and asserts that this is what empirically happened in the M & M experiments, and that this is why M & M observed no interference fringe shift. There was no greater distance/time interval for light to propagate from stationary light source to stationary mirror and back in Michelson’s apparatus in any direction. The M & M experiment measured exactly what it was designed to measure: the constant transmission velocity of light at c in all directions, regardless of any relative velocity of its apparatus (real or imagined), and nothing else. The implications of the M & M null result appear to be correct: there was no increasing distance/time interval for a light pencil to propagate in the direction of the Earth’s motion, from the relatively stationary terrestrial light source through a finite distance to the relatively stationary mirrors and back. Thus, there was no greater time interval that the M & M experiments could even theoretically detect. On its face, this is exactly and empirically what the M & M null results implied. Absent compelling empirical evidence to the contrary, these real reasons for Michelson’s null results must be believed. C. There was no motion (physical displacement or relative change of position of matter) within the light paths of Michelson’s apparatus that could be detected by Michelson’s interference method. A compelling technical reason. 1. The motions of terrestrial objects, i.e. Michelson walking around the room or cars moving in the street outside, relative to the Earth’s surface. 2. The daily rotational motion of the Earth relative to its axis at approximately 0.17 km/s. 3. The orbital motion of the Moon relative to the Earth at 1.4 km/s. 4. The solar orbital motion of the Earth relative to the Sun at 30 km/s, or the velocities of the planets, asteroids, and comets relative to the Earth. 5. The galactic orbital motion of the Earth at approximately 225 km/s relative to the core of the MW galaxy, or relative to any other star or galaxy. We empirically know that all of these relative motions actually exist, because we can visually observe them with our eyes, and optically observe them with our telescopes and other technologies. So, why did the M & M experiments not detect any of them? The only motion that was ever detected by the M & M experiment was the miniscule change of position (physical displacement) of one focusing mirror relative to the light source, which displacement adjusted the out-of-phase light waves from the two light pencils and thus created the interference fringe before the experiment began (Michelson, 1881, pp. 122 – 123; M & M, 1887, p. 339; Figure 9.4 and Figure 12.2E). But during the subsequent rotation of the entire apparatus through 360º over the next several months, the apparatus did not detect any other motion or displacement of the same focusing mirror from the propagating light rays by reason of the Earth’s solar orbital motion, or for any other reason (Chapter 9). What was the reason for this lack of detection; this paradox? In our search for another or a further answer for Michelson’s null results, let us again consider and compare the 1851 interference experiment of Fizeau, which was both very similar to and very different from the M & M experiment. Both experiments similarly involved the interference of light waves, a relatively stationary light source, a relatively stationary beam splitter, relatively stationary reflecting mirrors, two out-of-phase light pencils, and two finite light paths. The differences are set forth on Chart 12.7. 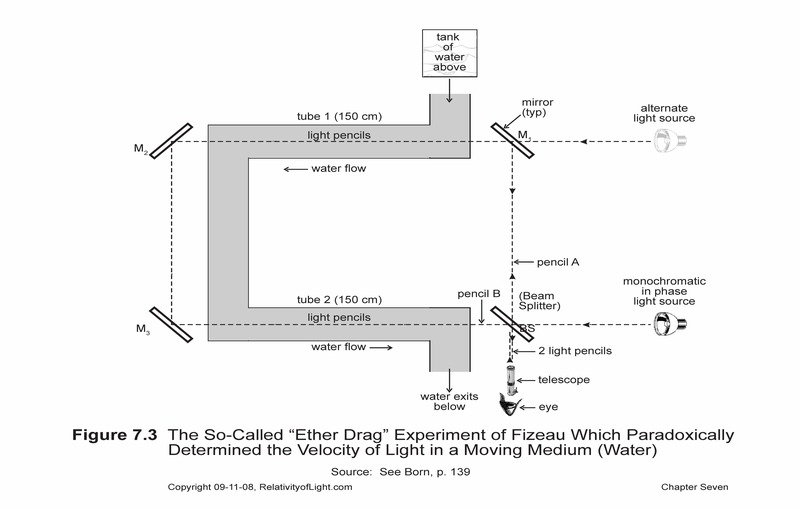 When the water (the light medium) in Fizeau’s 1851 interference experiment was observed to be stationary in the tubes (not displacing relatively to the stationary terrestrial light source), there was no fringe shift detected. 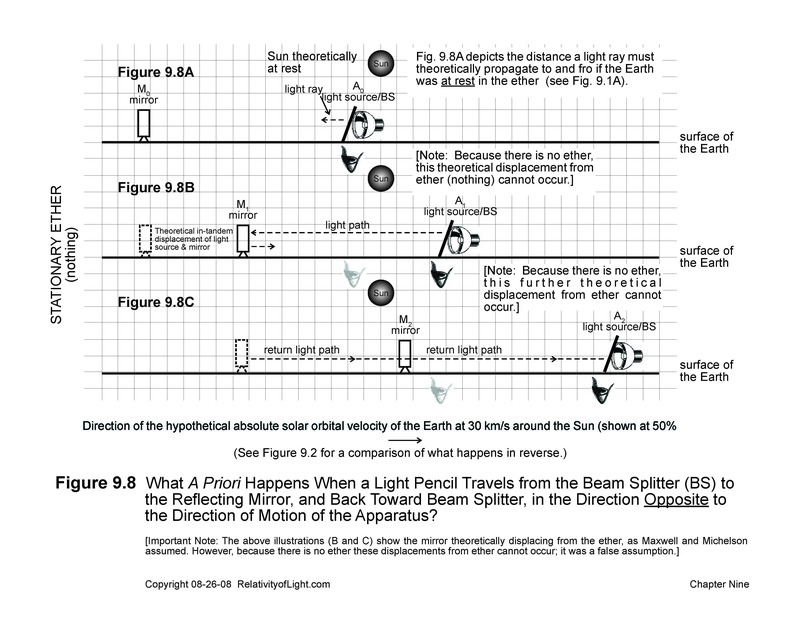 It was only when the water was observed to be moving through the tubes…vis., physically displacing relative to the stationary terrestrial light source and within the light paths of the light pencils…that a fringe shift was detected (Figure 7.3). Each fringe shift was partly (44%) proportional to the motion of the water and in the direction of such observed motion (displacement). On the other hand, during the conduct of the M & M experiment, neither the mirrors nor the air (the light medium) was observed to be physically displacing relative to the terrestrial light source and within the paths of the light pencils. Michelson only detected the measurable physical displacement of the focusing mirror and its observed direction of motion within the path of one light pencil (before the M & M experiment began). Neither experiment (Fizeau or Michelson) detected any relative motions outside of the paths of their light pencils, such as the motion of Fizeau or Michelson walking around the room or the motion of the Earth relative to the Sun or any other celestial body. The only way that we can optically detect the motion of the Earth relative to the Sun, the planets, or other celestial objects is to observe their relative positions over time within the paths of light rays received from such luminous bodies by our eyes, by our telescopes, by our other technologies, etc. If we took our telescopes to an enclosed room in the basement of the observatory, we obviously could not observe the relative changes of position of such luminous celestial bodies, because there would not be any light rays from such luminous bodies received by our eyes, our telescopes, or other technologies. This is in effect what M & M did. Their interference of light experiments were located in an enclosed room in the basement. How could Michelson detect the motion of the Earth relative to the Sun (or relative to any other celestial body), which he could not even see with his eyes? The empirical conclusion is clear. Just like the optical methods of visual detection, the interference of light method can only detect the motion or physical displacement of matter (i.e. moving water, the motion of the focusing mirror, or the motions of celestial bodies) within the light paths of the experiment (Figure 12.8). No motions of any other body relative to the motion of the Earth (or any motions of a material substance) were ever manifested within the light paths of the M & M experiment…so there was no way for Michelson to detect it by the interference of light method chosen. In other words, the M & M experiment was (for another reason) a “mission impossible” from its inception. The M & M apparatus and its underground location were designed to always produce null results. This technical problem was yet another real reason for the paradoxical M & M null results. Let us leave this subject with the following conclusion: A light ray in the M & M experiment (or in any other experiment) will always take a definite time to propagate back and forth between opposing mirrors (in the media of air and empty space) as long as the light path between the mirrors and the light source remains the same finite distance. In other words, as long as the mirrors do not physically displace from the material source of the light ray. Any assumed motion or velocity of the Earth or of the apparatus through space, or any assumed displacement of the mirrors from the light ray because of such motion, is irrelevant to the finite distance of such light path. In addition, Michelson’s interference of light apparatus could only detect a relative motion or physical displacement of matter within its light paths. Therefore, Michelson could not measure even a real motion outside of such light paths that his apparatus could not detect. As we shall discuss in the next few chapters, the paradoxical M & M null results greatly perplexed the scientific community. In desperate attempts to defend the concept of stationary ether, and to explain and justify the M & M paradox, Irish physicist George F. Fitzgerald and Dutch physicist H. A. Lorentz concocted two similar theories during the ensuing decade. They wildly hypothesized and conjectured that matter (i.e. 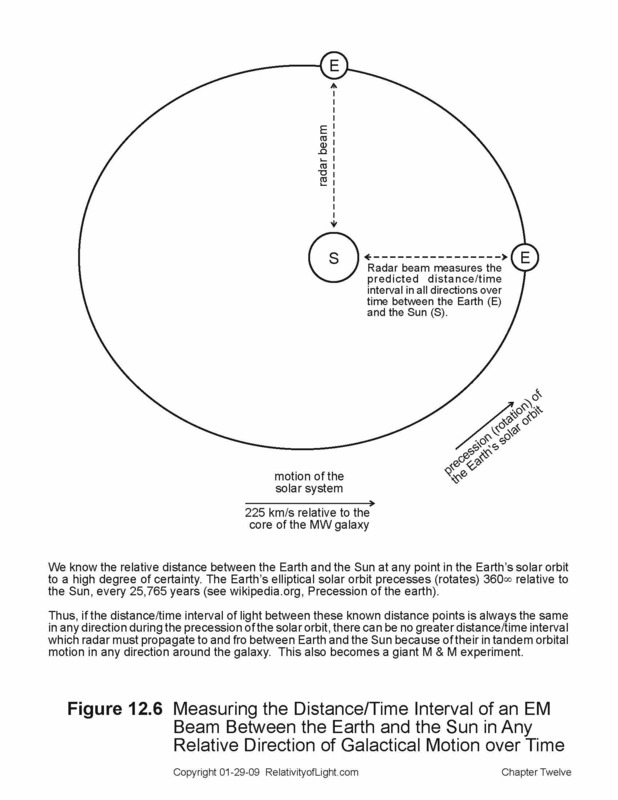 the Earth and the longitudinal arm of Michelson’s apparatus) moving through space must have been physically contracted in the direction of the Earth’s solar orbital motion, and that this specific contraction of distance was just enough to explain why M & M’s apparatus did not detect a greater time interval for the propagation of light within his apparatus (Chapter 15). In 1905, Albert Einstein in turn adopted the gravamen of these contraction theories and interpreted them somewhat differently in an attempt to defend Maxwell’s equations, and also in an attempt to explain and justify the paradox of the M & M null result (Einstein, Relativity, pp. 58 – 60). Einstein called his theory and interpretations, “The Special Theory of Relativity” (Ibid, p. 69). By ludicrous circular reasoning, the paradox of the M & M null results has even been cited as major experimental evidence that confirms the validity of Special Relativity and Einstein’s contraction of matter hypothesis. (Chapter 36). During the intervening century since 1905, Einstein’s Special Theory has been adopted and recognized as a fundamental scientific law. This “law” has dramatically changed many realms of physics and science in general and has resulted in numerous bizarre mathematical consequences. Special Relativity is also claimed to have modified or completely replaced Newton’s laws of motion. However, as we have demonstrated in this chapter and in Chapters 10 and 11, the M & M paradox can now be thoroughly explained by simple, straight forward answers that are consistent with Maxwell’s equations and current technology, and do not involve any radical hypotheses such as the contraction of matter. It should also be emphasized that only one of our numerous (theoretical, empirical and technical) explanations for the M & M paradox needs to be correct in order for such paradox to be explained and disappear. If no M & M paradox remains, then what valid reason is there to drastically change Newton’s laws and other laws of physics in order to attempt to explain a former paradox that no longer needs a contrived contraction hypothesis of desperation in order to explain it? The answer is, none! As we shall discover in Chapters 15, 22F and 26D, Einstein desperately needed the paradox of the M & M null results and his artificial contraction solution for such paradox, otherwise his fundamental second postulate concerning the velocity of light would become invalid and his whole Special Theory would begin to fall apart. What is another primary lesson to be learned from this chapter? Again, as with Chapter 10, it is to always trust observation and empirical results over theoretical prophesies and mathematical computations.